The stroke or cerebrovascular accident is very democratic on its course, what I mean is that everybody at the first stages begin more or less at the same starting point: completely laid in bed, without being able to move a part of our body. The control of the trunk while the patient is sitting is also a difficult task, especially if the back is not supported. The hospital personnel tries to have them sitting down on a wheelchair as soon as possible, and very often when they have not gotten enough control of the trunk. However, there are some specific signs which show the insufficient control of the trunk by the hemiplegic patient. The pain and the intolerance. When we are healthy, we sit without realizing that we shift the load continuously over our support base. In fact, if we stay permanently in the same position, even though it is for a few minutes, we will start to feel pain and discomfort. After a stroke or a cerebrovascular accident, in the first stages, when we still do not have an adequate control of the trunk; we have a reduced ability of movement, thus we cannot change the load on our support base. That is why the patient gets impatient when he is sitting on the wheelchair. This intolerance shown by the patient becomes more painful due to the perceptive disorders caused by the cerebral injury. In fact, it can happen that a coherent meaning of the information coming from our body cannot be specifically associated by the part of the body affected by the paralysis. Sometimes, our own organism faced with the incoherence between the corporal information, changes what “is felt” into pain in order to guide the attention towards the nature of the contradictory information. If to this phenomenon known as neuropathic pain, an unpleasant feeling situation is added, then the result will be that the victim will not be able to settle down on the wheelchair, and will usually ask to be put back to bed. The support of the superior “healthy” limb. The way he uses the opposite arm of the paralyzed one as if it were a “wedge”. This behavior can be shown through the use of the elbow as a support on the armrest of the wheelchair, moving all of his body over the healthy side, or with the extended arm resting on the knee of that same side, as if his arm in this position would be replacing the missing functions of support and the verticality of the trunk. For a more complete understanding of this behavior, we should take into account that after a CVA, we also lose part of our abilities to properly perceive our body in terms of its weight. Actually, many patients say that they feel “a force that propels them” to the hemiparesis side, which often corresponds to that half of the body that we are not allowed to perceive, but that at any rate exists and exerts its traction hence it is subject to the force of gravity. The enlargement of the support base of the feet. The balance that we have either standing or sitting also depends on the area of the support base and this in turn is also made up by the position of the feet. The wider their separation, the greater the surface of their support. That is why, sometimes we see that the foot opposite to the injury is guided backwards in relation to the hemiplegic one, as if making a square in a bigger surface that he would have if the feet were placed in parallel. When we are faced with this type of behavior, we can certainly deduce that the control of the trunk by the patient has not been achieved or it has not reached the necessary level to justify exercises aimed to achieve the vertical position, and much less to start training for walking. It must be clear that if we have not recovered the necessary requisites to keep a sitting position, then it is difficult to consider having a good standing position while the gait or the walk. In these cases, it is useful to have a greater impact with exercises aimed at the recovery of the trunk functions, not so much in terms of reinforcement but rather in terms or re-learning the abilities to gather the necessary information, like those that will allow us to build our medium line thus the symmetry. However, although it is difficult and not always qualitative acceptable, the human being is able to move on foot, sometimes with the help of a cane, and many times without one, even when these functions have not been fully recovered. In this case the patient often says that he is “afraid of falling” and that he has problems keeping the equilibrium, aside from showing the typical signs of the “hemiplegic gait”. Nonetheless, I believe that even in these cases, it is never too late to guide the attention to the recovery of the quality of the gait, with exercises that involve the recovery of the trunk. Although some of the parts of our body have been given names clearly provided of little mobility, like “trunk” and “column”, the back is a highly refined organ, with many possibilities of movement. It should be enough to say that it is made up by 33 vertebrates, while the hand which is universally seen as a very refined organ has only 27 bones. An organ which conditions us to make very refined movements, should also allow us to perform many operations and with them gather a great quantity of information with the surroundings. From that we deduce that in the therapeutic treatment we have to include the trunk with the same care we give the hand, based on what Dr. Perfetti defines as the “trunk compensation”. The disregard of the wheelchair. 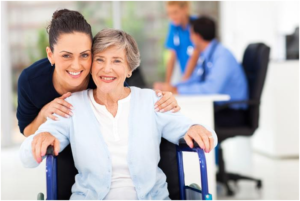 What happened in the first stages of the recovery, when the patient asked to be put back in bed, is also possible that happens in later stages, when we try to sit him down in other chairs different than the wheelchair. In fact, the wheelchair was devised with the purpose of alleviating the patient of the autonomous development of the trunk functions, since it has a comfortable back to lean on as a support base, as well as the armrests so they can use their arms substituting the trunk. For this reason, the patient will prefer the wheelchair rather than the kitchen stool. This article is very delicate because if it is misunderstood, it could produce a counterproductive effect. Therefore, I ask the reader to please be very careful in the next steps. If, and only if we are working on the rehabilitation with criteria, thus we are facing the problem of the stroke or the cerebrovascular accident through exercises that also involve the cognitive processes of the patient, then it is appropriate to act in a coherent manner with the work of the rest of the day aside from the hours dedicated to the rehabilitation, gradually detaching the patient from the wheelchair. My suggestion is to begin “colonizing” little by little, in situations where we help the patient to sit on a normal chair, and later on totally pass on in a compatible manner to a parallel recovery that we are achieving with the gait or walking. The first plausible situations to “colonize” could be the meals, or the three times a day where we face each other and have a face to face support which can give us more assurance. After that we can pass on to other daily situations like being in front of the computer or watching TV. My worry is to emphasize that this detachment takes place due to a rehabilitation that faces the after CVA recovery with criteria, and in consequence involving the real problem after the stroke, which is the alteration of the cognitive processes come from the simple fact that if we want to get rid of the wheelchair without offering our patient the adequate motor possibilities be it related with the control of the trunk or the walking, we will then be making our patient to live a longer time of discomfort and pain without even properly handling the sitting position. Sometimes the patient gets used to have autonomy at home moving around in the wheelchair, but something he could not do if he is sitting on a chair or to move from a room to another room with the help of a relative or worse with the risk of falling down.